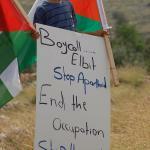 Occupied Palestine, 03 December 2014 - The Brazilian state of Rio Grande do Sul has cancelled a major collaboration deal with Israeli military company Elbit Systems in the wake of protests over the firm’s role in oppression of Palestinians. BARCLAYS branches across the country were forced to close after pro-Palestine activists staged sit-in demonstrations today. The protests were in response to the bank's holdings in Israel's largest military company which provided drones used in recent deadly strikes on Gaza. The flagship Barclays branch in Piccadilly Circus closed three hours early as 35 people from London's Palestine Action network held a sit-in occupation. The Palestinian Boycott, Divestment and Sanctions National Committee (BNC), the broad coalition of Palestinian civil society organisations that works to support the boycott, divestment and sanctions (BDS) movement, warmly salutes all those organizing events and actions to mark the UN Day of Solidarity with the Palestinian People. Akbayan (Ctitizens' Action Party) today protests an arms deal between the Philippine government Israeli military company Elbit Systems. In particular, on June 22, 2014, the government signed a US$20M deal with the Israeli military company Elbit Systems for 28 Israeli upgraded armored personnel carriers (APCs) that will be delivered in 2015. Eight transnational corporations (TNC), including the Israeli national wate rcompany Mekoort, have gone on trial on Monday in Geneva for the human rights violations they have committed around the world. 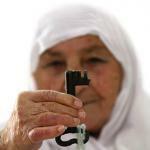 In Brazil the 15th of May - ‘Nakba Day’, that commemorates the expulsion of over 750,000 Palestinians from their homes and lands between 1947 to 1949 to make space for the founding of the State of Israel - was a day of active solidarity with Palestine and against Elbit Systems. Elbit is the Israeli military company that produces, among others, the Israeli drones used to kill and terrorize Palestinians in Gaza and the surveillance technology for the Apartheid Wall. 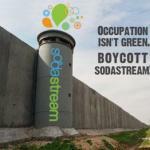 April 21, Washington, DC- On the eve of Earth Day, groups working for Palestinian rights globally are celebrating Earth Day Network’s decision to end its partnership with SodaStream, whose main production factory is located in an illegal Israeli settlement in the occupied West Bank. 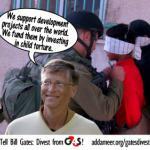 Palestinian human rights organisations have criticised Bill Gates after it emerged that his charitable foundation is heavily invested in G4S, a private security company that helps Israel run prisons at which Palestinian political prisoners are held without trial and subjected to torture and provides equipment for the checkpoint system connected to the construction of the Wall. 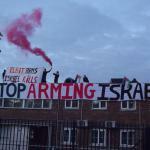 Activists announce: Portugal free from Mekorot! The agreement with MEKOROT in La Plata (Argentina) has been suspended! 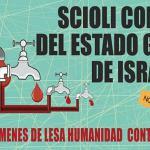 CTA, ATE, Federación de Entidades Argentino-Palestinas (Federation of Argentinian-Palestinian Entities) and Stop the Wall announced the suspension of the shady business with Mekorot, a water treatment plant that would have fuelled Israeli apartheid in Palestine and sought to export it to La Plata in Argentina. In January, the Brazilian cities of Porto Alegre and Canoas received the Thematic Social Forum whose theme chosen was “Capitalist Crisis, Democracy, Social and Environmental Justice". The event, an icon of the altermundism and of the anti-neoliberal, anti-colonialist and anti - imperialist struggle, is a space for global civil society to organize itself and to debate the global social-political agenda. Last Thursday, the 30th of January, the Norwegian Government Pension Fund Global (GPFG) announced its reconsideration over the previous decision made in August 2013, which rescinded the 2010 ban over two Israeli companies, Africa Israel Investments and its construction subsidiary, Danya Cebus. Since 2010, The Indian Campaign for the Academic and Cultural Boycott of Israel (InCACBI) stands in solidarity with the Palestinian people in their struggle for their right to live in dignity and exercise its sovereignty over their homeland. Now, the group calls for the divulgation of “From India to Palestine”, a compilation of fourteen essays on solidarity made by Indian authors that aims to re-exam the Indian position towards the Palestinians. December 24 2013 - Friends of the Earth International stands in solidarity with its member PENGON/Friends of the Earth Palestine and the Palestinian people in their struggle for their right to live in dignity and exercise sovereignty over their land and natural resources, including access to fresh water. Recently, Israel has started an initiative for negotiations for three to four missile speedboats to integrate in its navy. Israel already has six German submarines able to carry nuclear weapons. Within the framework of a bigger effort to stop the deal to further arm Israeli apartheid, two important German peace groups - Pax Christi and IPPNW - have given out the statement below. PLO Executive Committee member, Dr. Hanan Ashrawi, praised the recent announcement by Dutch water company, Vitens, to end its cooperation with Israel’s national water company, Mekorot, calling it a “necessary and moral decision”. 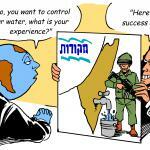 Mekorot is responsible for a number of violations of international law within the occupied State of Palestine. 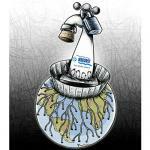 This includes the pillage of shared water resources and the denial of Palestinian access to their own water resources, in order to sustain Israel’s illegal settlements. The spirit of the struggle against apartheid lives on! With the passing away of Nelson Mandela, South Africa has lost a truly inspirational leader of their struggle against apartheid. The world has lost a symbol of the human quest for justice and equality. 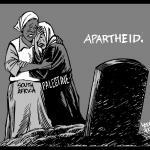 Palestine has lost a comrade in the struggle that never forgot the natural bond between two people fighting apartheid. 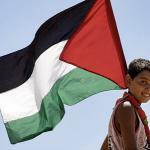 Once again Argentina has voiced its allegiance to Palestine. Argentinian Congresswoman, Dr. Maria Elena Chieno, who heads the group of Argentinean MPs on Palestine and participated as one of the testimonies in the Ethical Tribunal on Palestine arranged in Argentina submitted a new draft legislation last September.